The whole family loves this filling Mediterranean macaroni cheese. Cook macaroni in a pot of boiling water, then drain. Melt butter in a saucepan, then cook the onion, garlic, capsicum and mushrooms, stirring until softened. Add flour, stirring until the mixture thickens. Gradually stir in the milk. Add passata, stirring until the sauce boils and thickens. Add the cooked macaroni, olives, basil and half of the cheese into the sauce. Place mixture in an ovenproof dish, sprinkle with the remaining cheese. Grill until the cheese melts. Notes... 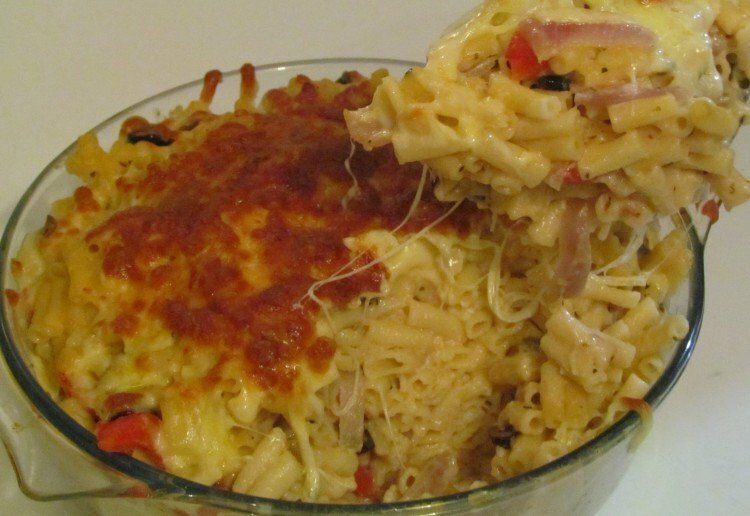 This recipe make an enormous bowl of macaroni cheese and I always have some leftover to freeze. It does freeze well and it is handy to have little tubs of this delicious dish in the freezer. Just like grandma used to make – thanks for sharing. Seems a great one to make for work lunches , to give them more choices for lunch. Sounds delish. Love fresh basil. nice to see a healthy version of my son’s fave meal! This brings macaroni cheese to another level ,i love it. who would not love this recipe! It sounds really hearty, nawty but yummy! my kids would love this recipe…and so would i! These look delicious. I love macaroni and so do the kids. I like the veggies in it,makes it interesting! It give the dish a lot of colour and texture and it is filling. with the capsicum and mushrooms, this really is a mac and cheese that stands out! my kids love it so this has now become a great way to hide the vegies lol. Thank you! We love it and the capsicum and mushroom give it a lift and…. anyway to hide vegies is a bonus and they taste good in this dish.